These are good quality Fresnel Lens Magnifying sheets. They are great for reading newspapers and books and are also useful for very lite-duty solar projects and for survival kits for starting camp fires. ---✔CRYSTAL CLEAR LENS IN HD QUALITY: This led magnifying glass magnifies up to 6X(600%) and is perfect for DISTORTION FREE reading/viewing small prints or objects Map, jewelry, Newspaper, Magazine and also great for eye conditions such as aging eyes, macular degeneration. 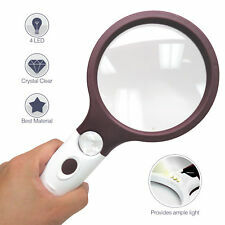 ---✔ 3 LONG LASTING & ULTRA BRIGHT LEDs: This magnifier is equipped with three power saving integrated LED light designed to last for 25,000 hours without buringout or overheating, they are operated by 3 AAA batteries(NOT included) ---✔ LIGHTWEIGHT & ERGONOMIC FITS PERFECTLY IN YOUR HANDS: Weigh only 4.5oz which is comfortable to hold without straining your arms with an ergonomic slip-free handle making it ideal for long reading time, suitable for seniors or kids for science class. 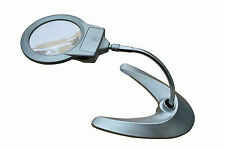 ★IDEAL MAGNIFICATION FOR READING: All the magnifying lenses included in this papckage magnify up to 300%. It is considered the most comfortable magnification for reading small prints, ideal for ★NON-TOXIC & UNBREAKABLE MATERIAL: The lens is made out of optical grade PVC a superier material than other fresnel lens, which provides crystal clear image quality with minimal distortion, ★3 BONUS BOOKMARK MAGNIFIERS: Each package comes with 2 page size sheets and 3 bonus bookmark magnifiers, due to it's compact size, its east and convenient to bring them with you so you will. ★LARGE AND POWERFUL- 2X Letter size full page size 11"x 8.5" optical grade acrylic magnifying lens, covers large viewing area(magnifies an entire page at once) minimize your movement of hand. ★PREMIUM OPTICAL GRADE QUALITY: Best for examining fine prints in newspapers, documents, maps, electronic parts, photos, and pill bottles. ★LIGHTWEIGHT & ULTRA SLIM- Ideal for long reading time without tiring hands and it's very convenient to bring it with you to travel..
Optical Quality Lens, No eye exam or prescription needed. Great for sewing and crafts, reading fine print, detailed work, etc. $About the Product · ✔ PREMIUM QUALITY- Made of durable optical grade shatter-proof acrylic for minimal distortion. · ✔ ERGONOMIC COMFORT GRIP- Ergonomic design comfort grip ideal for ling writing time without tiredness. 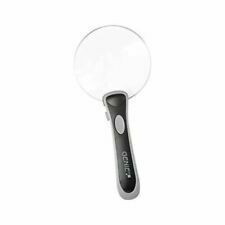 · ✔ BONUS CREDIT CARD SIZE MAGNIFIERS- Each package comes with 3 premium credit card sized magnifiers easily to travel with. 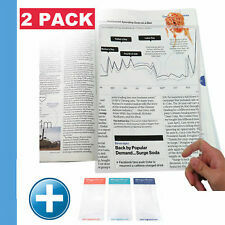 · ✔ PERFECT FOR READING & WRITING: 2X Magnifying pen is very handy that can be easily traveled with you and magnify the small prints when needed · ✔ SATISFACTION GUARANTEED-100% No-Hassle Money Back Guarantee： No hassle return policy, If you're not happy with your purchase, we will give you a full refund. No questions asked. Zeiss Lupenbrille mit Aufbewahrungsbox. Arbeitsabstand: 350mm. Magnabrite® is the original light gathering magnifier since 1950. DON"T BE FOOLED BY LOWER PRICES. WE WON'T BE BEAT. FIND A LOWER PRICE?. Jeweled 10x/1x Compact Mirror with Crystals. 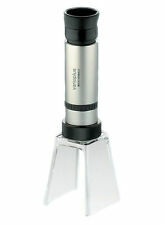 Compact features two mirrors in one compact, 10x and 1x magnification. This stylish compact mirror is adorned with Crystals to add elegance and a girly touch. 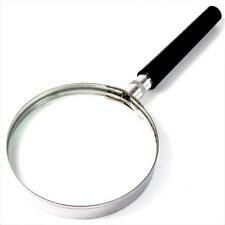 This Magnifier is ideal for tasks such as handcrafts, knitting, sewing, reading, embroidery and much more. It is ideal for precision jobs and fine print reading. Browse All. 4 Built in LED Lights on Underside. Neck cord & rest feet for hands free operation. 1.5x Crystal clear acrylic lens with a 4.25 x Bifocal spot lens. Magniloupe Set. The MagniLoupe™ is a unique 4-piece eye loupe set with an included smartphone clip. The four loupes are: 4.5x, 6.5x, 8x and 13x power. The smartphone digiscoping clip is compatible with iPhone, Samsung, LG, Huawei and Google Pixel phone models. Perfect for fly-tying and all fly-fishing needs. Complete with protective soft-pouch, its crystal clear acrylic lenses give you a sharp, distortion-free view that allows you to see even the finest details with ease. ★ THE MOST COMFORTABLE LIGHTING SYSTEM FOR YOUR EYES: This led magnifier is equipped with 12 anti-glare SMD led lights, which provide more evenly lit area than traditional LEDs, lighting does not focus on one point rather scattered within an area. ★ LARGE VIEWING AREA WITH CRYSTAL CLEAR LENS: Optical grade magnifying lens covers large viewing area without having your hands to move all the time, lens(viewing area) is measured 4.5""x 7"" and magnifies up to 300%. ★ 12 ENERGY EFFICIENT SMD LEDs CONTROLLED BY DIMMABLE SWITCH: Our SMD LEDs are designed to last 50,000 hours not only provide more evenly lit and brighter viewing area but consume less power than traditional LEDs so a new set of batteris would last longer. Klapplupe mit Griff im Taschenformat Lupe vergrößert 2,5 fach Taschenlupe Klapplesehilfe. Die Klapplesehilfe ist ideal für unterwegs und passt durch Ihre geringe Größe in jede Tasche. Schöne Lesebrille 3,0 braun für Sie & Ihn Lesehilfe mit Etui Flexbügel Kunststo. ★ RECTANGULAR SHAPE & LIGHTWEIGHT DESIGN: The magnifier itself only weight 5 ounces , therefore, it is ideal for longer reading time, it weights only half compare with other reading ★ HIGH QUALITY 3X OPTICAL GRADE MAGNIFYING LENS: The main lens is measured 4.35" x 2.5" and magnifies up to 3x(300%), due to it's LARGE size you don't need to reposition it all the time to find ★ LARGE SHATTERPROOF/RESISTANT ACRYLIC LENS: The lens is made out of optical grade acrylic which is lighter and more shatter-resistant than glass while provides the same clarity level, the. Eschenbach EINSCHLAGLUPE Lupe Hand-Lupe Taschenlupe 173053. Modell 173053. 173053 45 mm Ø 10,0 dpt / 3,5x. Einschlaglupe schwarz. optimaler Schutz der Linse durch das Lederetui. klein, handlich, platzsparend. Schöne Lesebrille 3,0 braun für Sie & Ihn Lesehilfe mit Etui Flexbügel Kunststo. Schicke Lesebrille 2,5 für SIE & IHN schwarz-pink Lesehilfe mit Federbügel Etui. I NEED YOU Lesebrille 2,5 Modell "Action7" grau-matt für Sie & Ihn Lesehilfe Se. Check out our other glasses and accessories for sale! 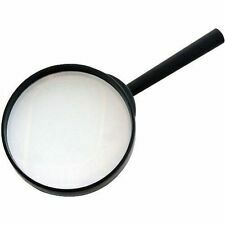 You Will Receive : 1x Magnifying Glass With Light LED and string. You can hold the magnifier, hang it around your neck, or fold out the integral feet for free-standing use, just at your convenience. 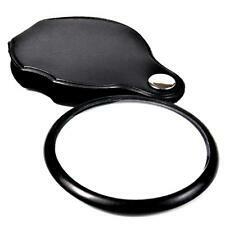 Giant hands free magnifier with 4 bright LEDs. 5x magnification, Diopter: 21D, Lens Type: Biconvex Non-illuminated compact pocket magnifier Lens Size: 30 mm. 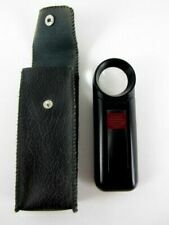 Overall size: 7cm x 4cm Casing: dark grey Case: Built-In Case Material: ABS Plastic. 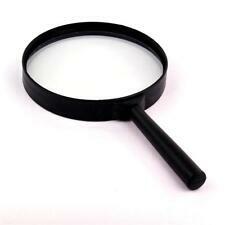 Magnifiers and Accessories.